Stock Number: 723819. 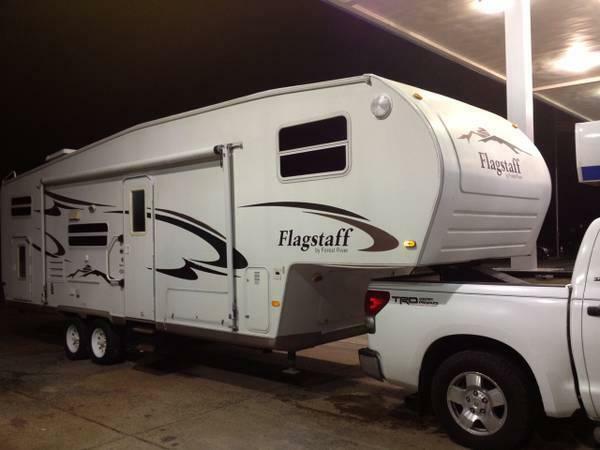 2006 Flagstaff by Forest River 30' Fifth Wheel Camper, Excellent condition throughout. New roof membrane by Superior RV. Large 10 cu/ft Whirlpool fridge, Pantry for food storage, 19"TV and surround sound, Ultra heat grey water storage tank heater, gas/electric water heater, exterior gas grill, 3 burner interior gas stove and oven, microwave, powered vent hood, ceiling fan, tons of storage, new tires, rear receiver and trailer light connection for towing second trailer. Queen bed in master bedroom, two 42"X72"� bunks in bunk room, convertible dinette and convertible couch. Sleeps 9 comfortably. 12' X 42"� super slideout in living/kitchen creates large spacious living area. Sleeps lots of people! Aluminum Structure, Super Light Weight version, Max gross weight 7500 lbs, towable with a half ton pickup truck! Tripod stand, fifth wheel hitch and propane tanks included w/sale! Call, text or email for more info, pics or to take a look in person. Dean 318-581-2228.